Rayna’s Overnight Desert Safari Dubai is a great way to experience the sights and sounds of Arabian Desert night in company with mesmerizing stars. Offering a perfect balance of Emirati culture, nature and adventure, this unique desert trip promises you a profoundly illuminating and revitalizing experience during your Dubai vacation. The tour starts with an adventurous 4X4 dune bash which involves an exhilarating ride through the endlessly long and impressive sand valleys. This is followed by an array of fun activities by way of camel ride, photographic opportunities in traditional Emirati costumes, charming henna tattooing, and Shisha smoking. 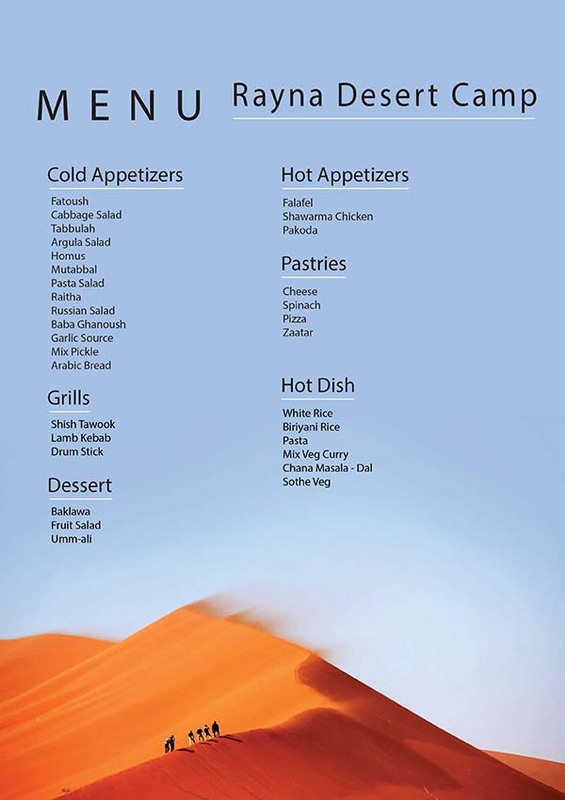 As the sun sets in, you can unwind in our desert camp that well recreates the Bedouin ambience or even recuperate by the fire, until we serve you a scrumptious BBQ dinner with a delectable range of salads, starters, and desserts. After an amazing belly dance show come the real highlight our overnight safari. We’ll arrange you superb facilities for an all-night stay in our desert camp, with sleeping bags,blankets, and unlimited tea / coffee. Needless to say, spending the night in an intimate Bedouin tent, beneath the starry Arabian sky, will turn out to be the main highlight of your Dubai trip. In the morning, you can enjoy the stunning desert sunrise views and later a delectable breakfast, before you leave the wilderness of the Arabian Desert. So for an adventure trip as never before, contact one of our tour specialists. The rest is assured that you’ll have a memorable desert journey with Rayna Tours. Enjoy the might of the desert. Start with dune bashing followed by exciting fun activities, sumptuous dinner and a night under the star lit sky. Enjoy the best of Overnight Safari with a thrilling 20 minutes Quad Bike ride. Giving your overnight safari a Royal twist, we bring to you an exclusive service of sumptuous BBQ food served on table just for you. Enjoy the best of overnight safari experience with us. Bash the dunes, enjoy delicious dinner and lots of fun activities overnight stay in air conditioned deluxe room with B/fast in the morning. Enjoy the best of overnight safari experience withus. Bash the dunes, enjoy delicious dinner and lots of fun activities with unlimited Alcohol. Pregnant women or guests with backache are not recommended for the Dune Bashing activity. Belly Dance show, Tanoura Dance, alcoholic beverages and music for entertainment will be closed during the holy month of Ramadan. Guests can still enjoy the dinner and non-alcoholic drinks in the camp, as well as other activities. This was an absolutely amazing experience! Our driver king of the desert picked us up and was very patient and accommodating whilst we were running late. We had a blast dune bashing. The night got even better with the shows and we paid a small price extra to get table service (which I highly recommend as food arrives to your table first!). The shows were fantastic and the staff were all so amazing. After all the day tour people left, the staff lit a bonfire for us and provided sheesha and some great company! For anyone looking to do this, the overnight stay is definitely worth it! I can’t applaud all the staff enough for being so amazing! I have to thank Rayna Tours for offering me this wonderful experience. Dune bashing and sand boarding were my number one favorite here. I would go back again with Rayna Tours to experience Dubai’s desert safari in the night. Please try Rayna Tours package because you will get the best deals with them. Would only say this in plain simple, if you want exciting and fun in your life, then you need to experience some of the best experiences of Dubai’s desert in the evening. Overnight desert safari was once in life experience!! My journey and experience has been the best of my life. Rayna tours excellent package allowed me to enjoy something I had never done before.